This paper examines the viability of the concept of “technological momentum” from Thomas Hughes’ Technological Systems Theory in the context of the adoption and use of online courses in post-secondary education. A case study approach using qualitative interviews is used to explore the “technological momentum” of the classroom as professors adopt the use of online courses. The findings provide specific examples of how previous classroom practice influences professors’ attitudes and practice in relation to the adoption and use of online courses. Universities are often seen as bureaucratic organizations that are slow to change in reaction to outside pressures (Bercuson, Bothwell, & Granatstein, 1997; Daniels, 1996; Laidler, 2002; Miller, Martineau, & Clark, 2000). For some, such as Taylor (2001) and Daniel (1996), this is an incongruous idea. Both noted that while, in many cases, universities are resistant to change they are seen as sources of innovation for society. Many scholarly writers have commented on how with the challenges they face, the social structure at universities will be forced to change (Daniel, 2000; Noam, 1995; Psycharis, 2005; Rajasingham, 2005; Singleton-Jackson & Newsom, 2006). Noam (1995) predicted a “dim future” for universities as new technologies change the three primary functions of a university: the creation of knowledge, the preservation of information, and the transmission of this information to others (teaching). He envisioned a rise of commercial firms that will offer undergraduate and professional education more efficiently than the current university structure. According to Daniel (2000) two realities are setting the agenda for higher education in the “new economy” of the 21st century; lifelong learning and the use of educational technology. Lifelong learning, he claimed, will be the norm and the huge increase in the number of students will place tremendous demands on current educational structures to change. The availability of new technology, and its integration into education, will be factors that help universities meet these new demands for lifelong learning. He sees the rise of “mega-universities” as a possible response to the demands of the new economy. Rajasingham (2005) talked about “virtual universities” as a means of addressing some of the challenges Daniel (2000) outlined. Rajasingham, however, predicted these “virtual universities” will exist at the same time as and work with traditional universities, while also responding to globalization and the use of new educational technology. Prensky (2001) made the point that the nature of the social system at universities is being altered by advancements in information and communication technology. He contended that “today’s students are no longer the people our educational system was designed to teach”. While current students are “digital natives” who have spent their lives using computer games, e-mail, cell phones, instant messaging, and other technology, the education system is organized by “digital immigrants” who do not speak the same language or, if they do, speak it with a strong accent. Prensky argued that educators will have to change both teaching methods and content to make learning more meaningful to students. 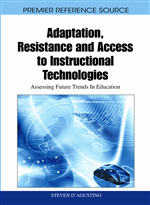 More recently, Prensky (2006) outlined some of the features that will be important for educators in the 21st century. He suggested that educators will have to shift gears and pay attention to how students learn, collaborate more with students in terms of what they teach and how they teach, provide more flexible organizations, integrate digital tools into teaching, as well as provide content that is relevant and up-to-date.